Why I’m thankful for Donald, Angels in Khakis and Librarians. As the green Jell-O melts at the Thanksgiving table, your father-in-law mutters an updated version of the prayer he said last year. It includes family members, a line about world peace, a reiteration of the poem about the footprints in the sand, gratitude for Costco for having pumpkin pies on sale. But as you secretly wish he’d hurry up so you could eat already, would you ever want that prayer to say thanks for someone you’ve disliked on facebook? When I said my wedding vows nineteen years ago, I never dreamed my marriage would end at a Grey Hound bust station in Green Bay, Wisconsin on the night of a Donald Trump rally. But it did. My husband and I had grown apart, physically and emotionally, he living in Door County and I in China. And on the night of a Donald Trump rally, we had a fight over everything and nothing. I learned that my marriage was not a De Beers diamond commercial when my soon to be ex husband chopped up my credit cards. This was a real quagmire, or in Chinese, a mafan (bad rice), as the majority of my cash was colorful yuan. I had to find my way back to China, the first leg of the journey being a ninety mile journey to Green Bay. I couldn’t order an UBER as a credit card was required to use the new service. I didn’t have any friends to help me. All I had was a pocket full of Chinese yuan, shards of my credit cards and a one hundred dollar bill, which wouldn’t be enough to pay for a cab. Luckily, along with the pink faces of Mao Zedong, I did have a Greyhound bus ticket to Michigan, looping over the Upper Peninsula (you know things are bad if you think having a Greyhound ticket is lucky) But the bus wouldn’t be pulling out of Green Bay until midnight, which gave me a few hours to figure out an escape plan. The good news was that Door County is just like jumping into a Norman Rockwell painting. Friendly faces with freckles eating cheese curds and other dairy products. I just had to figure out how to jump out of it to make my bus like midnight. And there was one place I could go to find answers and hopefully a few carpool numbers scribbled on a bulletin board. I crossed my fingers, hoping there be an old-fashioned bulletin board in the foyer cluttered with cottage rentals and carpoolers. But all I found was a box of Nora Roberts novels under a stuffed deer head. I wiped my nose and walked inside the temple of knowledge, and hovering over the return cart, I saw my anwer. A librarian. She was bout my age with a beaded lanyard dandling around her neck, most likely purchased at one of the artsy-fartsy touristy shops. The librarian furrowed her eyebrows. A guy in the periodical section tuned in. I wasn’t a local patron with a library card who wanted to bum the bathroom key. I was an out-of-towner with panda eyes from crying. I was the me I thought I would never be. “You got to be kidding.” I still couldn’t believe that the host of the Apprentice was running for president. But the chances of him winning would be as likely as the Cubs winning the World Series. Forty-five minutes later, I get into an old Taurus with someone referred to me by a librarian, accepting her recommendation as if it were the debut novel by a new author, headed towards the epicenter of Making American Great Again. Did I mention I was in the state known for serial killers and dairy farms? Jeffrey Dahmer, David Spanbauer, Ed Gein, and squeaky cheese? But I’d take my chances. After all, any driver in Wisconsin would be safer than any cab in China. He didn’t go to church much but his actions that day were more Christian than most pew warmers. I arrived at the Greyhound station five hours too early, buying the Good Samaritan a tank of gas and a Super Gulp. I walk into the terminal and on every screen was the broadcast of the event happening just two blocks away. If I went to Donald’s rally, it would be a distraction. From the wait, my marriage, my everything. I look around the station for an accomplice. Slim Pickens that day for a place famous single mother’s holding crying babies, marines heading back to wherever they are stationed, parolees with tickets to their grandmothers. But scrounging around the vending machines, there was an older gentleman checking for change. The ticket agent behind the bulletproof glass seemed to know him. Over the next few hours as we moseyed around T-shirt hawkers, Trump supporters and Hillary haters, Zachariah tells me how he lost a daughter to a bullet, his wife to a lump, his job to a factory closing. Yet I was the one crying. I swear Zachariah was an angel in second-hand khakis. He even carried my bag. “The station closes at nine. I can stick around for a while,” he says looking around the parking lot. “I’ll be OK.” Zachariah smiles then disappears to who knows where, leaving me blubbering on my duffel and waiting for my bus back to the rest of my life. I swatted mosquitoes for a few hours and waved at the occasional police car making its rounds. But then, around ten, I saw a thin figure walking towards me. His boots click on the pavement, his mustache a throwback from the seventies. My heart leaped into my throat. I didn’t have mace or a cell phone to call 911. I wished that the cops would make another round. JESUS DIED FOR YOU. 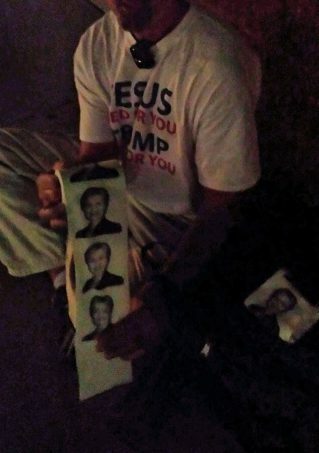 TRUMP LIVES FOR YOU. “Designed it myself,” he says. I felt it wasn’t the time to share my political views. I notice what is in his hands. It wasn’t a gun or deer knife to skin me alive. 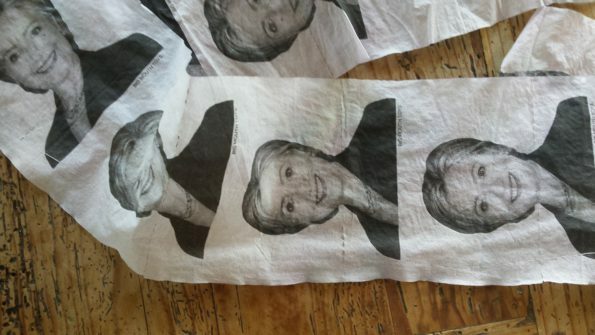 It’s a roll of toilet paper with Hillary Clinton’s face. Hillary’s face was blotchy black and white, her eyes wide, her mouth open. Who’d ever think I’d run into her at a bus station. Mr. T-shirt looks at my face, my eyes still swollen from my crying. He rips me off a few squares. We talk for a while under the lights, about everything and nothing—except for politics. I wonder if this guy is an angel, too. A bus pulls up around ten. “Appleton?” the driver asks. The stranger boards the bus and once again, I’m alone swatting mosquitoes and waving to the police as they make their rounds. Years later, I think about the day, the ending that seemed as impossible as the Cubs snatching the pennant and the host of the Apprentice becoming president. I have no idea of the long road ahead of me. The journey of divorce and recovery is a lot longer than the bus ride and flight to China combined. But I thank God for Good Samaritans with old Tauruses homeless guys for their stories, Hillary haters for wiping my tears. And yes, I am even thankful for Donald for bringing us all together that day. If a love story has to end, the final episode should be star-studded. Don’t let a comment from a stranger on facebook make you forget you stands by you when you’re in need, whether that need is for crispy onions for your green bean casserole or help you bury a loved one. As for the Good Samaritan in the Taurus? he ended up being the father-in-law of my husband’s attorney…the attorney who got custody of my seven foot marlin. Tagged china, expats, hillary, library stories, midlife divorce, trump, where did your marriage end. Bookmark the permalink.